Write It Down: Analysis of "Moaning Lisa"
The episode tackles an emotion that many of us have encountered in our lives, depression. 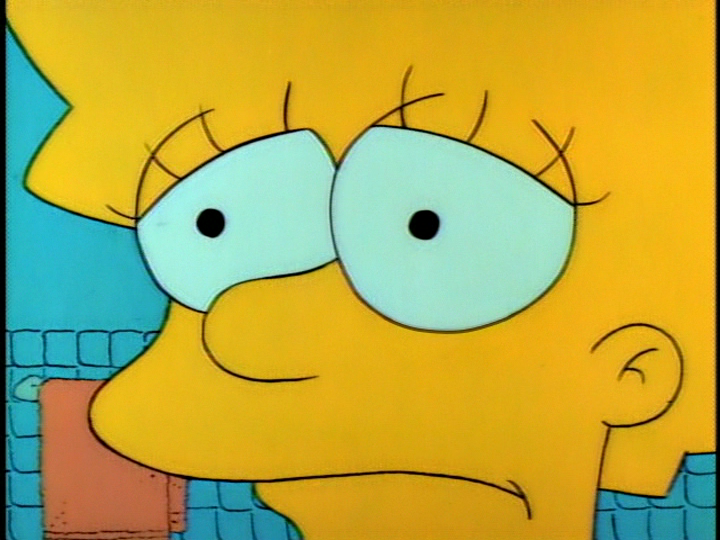 The opening shot is a close up of Lisa’s drained face. In the background, the digetic sounds of the water dripping and the ticking enhances how everlasting her sorrow is. You want to wonder what depressing thoughts she is contemplating. 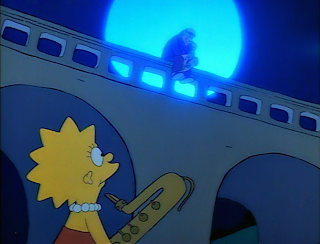 The first time I ever saw “The Simpsons” was from the scene where Lisa sees Bleeding Gums Murphy on the bridge playing his saxophone. There is an element of sketchiness as to what a girl would be doing alone at night. 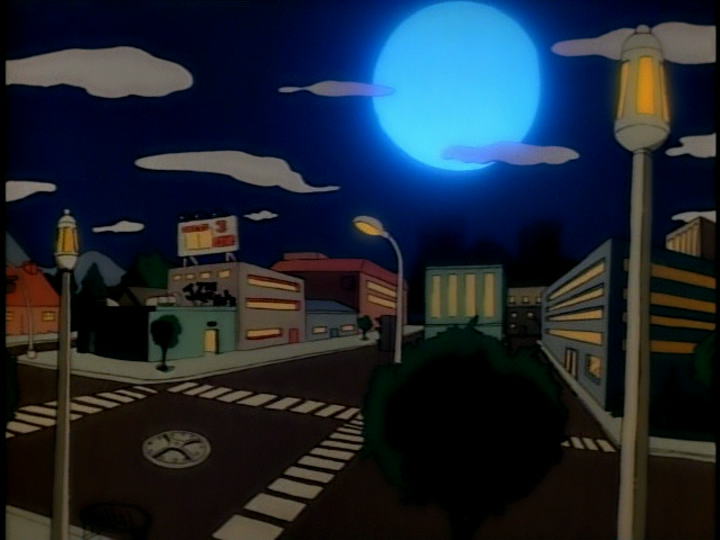 I was struck by how beautiful the scene is layed out with Bleeding Gums Murphy on a bridge under a streetlight on the bridge. The hair points on Lisa’s head resemble a star works perfectly in contrast with the vibrancy of the neon moon. The color stylist’s choice of the blue moon adds to the calming effect the saxophone has upon Bleeding Gums Murphy and Lisa. The embracing tune of the saxophone is what begins their friendship. I felt glad for Lisa that she found a friend that shared a common interest. By playing the blues together, they are able to relieve their stresses. 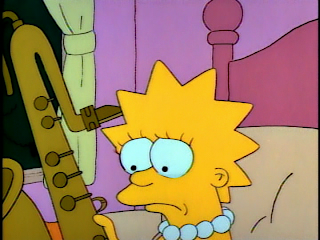 Lisa plying her saxophone in order to comfort herself would be a recurring motif in “Bart Vs. Thanksgiving”. 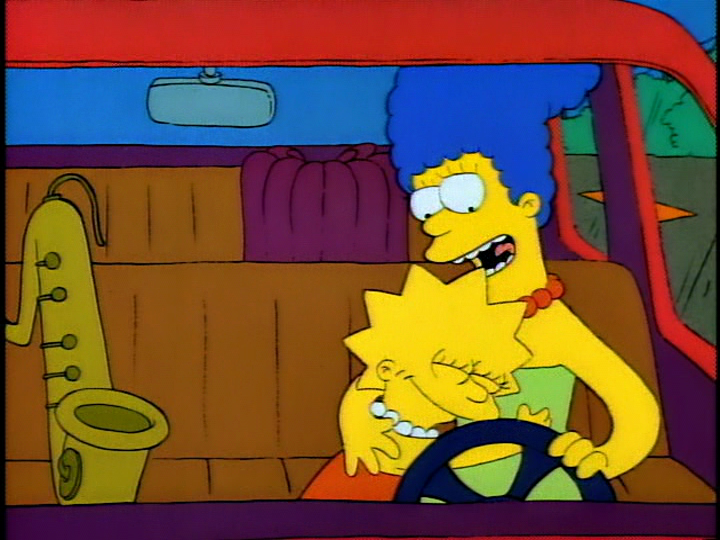 One scene that particularly resonates with me in recent years is when Marge tells Lisa to fake being happy so people will like her better. While said with good intentions, what Marge gives Lisa is actually really bad advice, because by repressing her feelings deep inside, they can be unleashed later in undesirable ways, or cause her to develop a complex. If we’re not honest with others, and ourselves it’s unhealthy. Thankfully, Marge redeemed herself when she saw how Lisa’s fake happiness caused her to be taken advantage of immediately (“You can do my math homework!”). When Marge apologizes and says she can stop smiling and Lisa responds, “I -feel- like smiling.” with a sincere smile, it’s an acknowledgement that she knows Marge cares about her true feelings. A sweet moment. 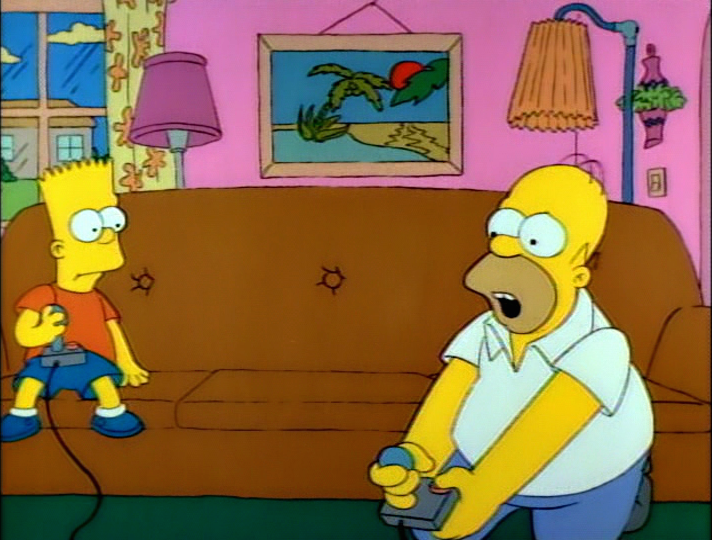 The subplot of Homer and Bart playing a video game is a good balance to the seriousness of Lisa’ depression. The few moments where Homer and Bart are bonding is always enjoyable. During the final rematch, Homer’s mood transitions from being on the verge of defeating Bart to weeping when Marge unplugs the console is enjoyable. 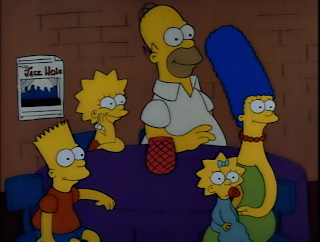 When the Simpsons watch Lisa’s poem preformed by the beatniks, the contrast of colors is nice. The best part would be Homer’s reaction to the lyrics “My father acts like he belongs in a zoo.” Initially he is content, but is soon alarmed. The scene zooms out to showcase “The Jazz Hole” exterior, with a dreamy blue moon behind the building. The smooth tone of the saxophone adds to the perfect ending. Yeardley Smith’s excellent vocal talent is utilized when performing Lisa. When you hear her expressing melancholic thoughts, you can sympathize with the pain she is enduring. Out of all the members in the Simpsons household, Lisa is a delicate gem, you can’t bear seeing her sad. Lisa feeling sad was powerful motif that future show runners Mike Reiss, Al Jean and other writers would explore. If it is saying goodbye to your favorite teacher (Lisa’s Substitute), disappointment when your father has let you down (Lisa’s Pony), lack of confidence about your beauty (Lisa The Beauty Queen), and experiencing the passing away of your best friend (Round Springfield). Lisa is a character that experiences many painful moments, but she rebounds quickly. “Moaning Lisa” was the sixth episode of “The Simpsons” to be broadcasted. It marks the transition of Lisa’s personality from a hell raiser to intellectual. Many viewers of the show criticize how this entry is saccharine; On the contrary, it demonstrates how “The Simpsons” could differ from other animated cartoons, but one that could have real emotional impact, and a story to tell.